Penicuik Hunter & Lass Fraser Howie and Izzy McNiff, and junior counterparts Jack Drummond and Emily Marshall. Photo by Paul Valis. Penicuik Hunter and Lass, friends, Fraser Howie and Izzy McNiff, will be joined by their junior counterparts, Jack Drummond and Emily Marshall, during the week-long annual festival, taking place this year from May 18-25. This year’s Hunter, Fraser Howie (22), has lived in the town all of his life. The former Mauricewood Primary and Beeslack High School pupil is now a machine operator at a sawmill, and also runs his own cleaning company Scrub-A-Dub Cleaning. Speaking about his appointment as Hunter, he said: “It’s amazing. A dream come true. I have always wished this as a young boy growing up in Penicuik. I can’t really believe it. “Izzy and I were quite lucky. We were elected last year. So we have both done a bit already. We have been to common rides and balls. “I’m really looking forward to the week itself. We didn’t get to see a lot of the big day last year as were on the horses and the principals’ party were away doing their thing at Penicuik House. So to be in front of all of the town blowing the horn is going to be great fun. Izzy McNiff (20) attended Cuiken Primary and Penicuik High School. She currently works at McDonald’s at Straiton and part-time at a riding stable in Peebles. She said: “I’m really excited about it. A wee bit nervous obviously, because I’m representing Penicuik, where I have always lived. I’m really looking forward to the ride outs as I’m already a horse rider, but also just getting to meet new people in the other towns we visit. “We were elected last year, which gave us a chance to see what we were going into. I think it makes it more exciting , sitting watching it last year knowing your year was coming. 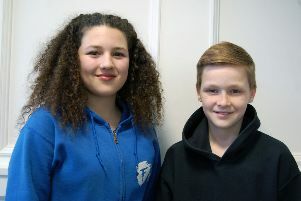 Junior Hunter Jack Drummond (11) and Junior Lass Emily Marshall (10) are both pupils at Cornbank Primary, the school chosen to provide the Juniors this year. Jack’s mum Natalie said: “He is really excited about it. Everybody in the family is really excited. “We are looking forward to Jack being in the parade and everything else. I think he is going to do his school proud. He is taking it quite seriously. Emily’s dad Peter said: “We are very proud of her. I think the experience is going to be really good for her. She is really excited about it. Meanwhile, following an article in the Advertiser last month, the popular Penicuik on Parade event now has a committee in place and will go ahead as planned on May 25.